“Mindful consumption is the object of this precept. we will come to know our own nature very well. Practicing a diet is the essence of this precept. it can manifest in wars and bombs. Removing the bombs is not enough. are still intact in our collective consciousness. 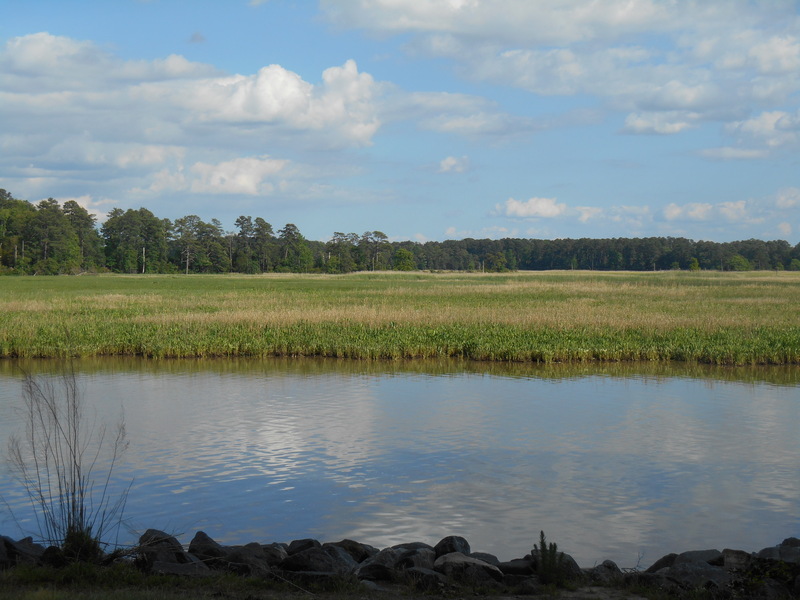 Early spring along the James River, and its creeks, near Jamestown Island, Virginia, brings greening to the marshes and the surrounding forests. 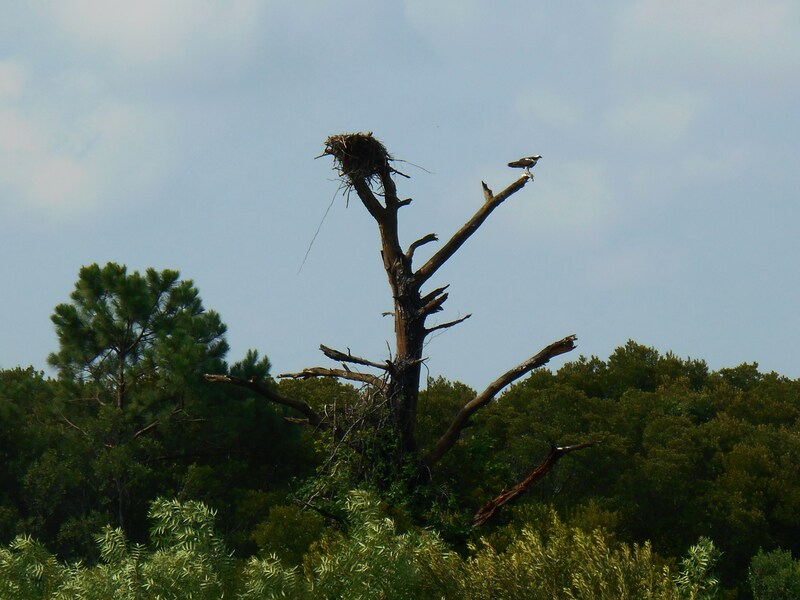 Osprey and Bald Eagles build their nests for the season, along with many pairs of ducks, geese, herons and egrets. 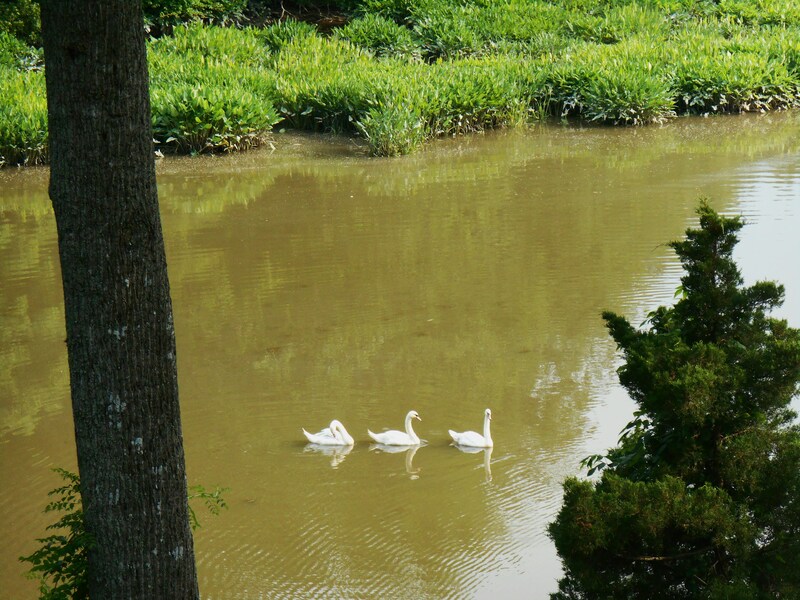 Migrating birds stop to rest and feed. The landscape awakens for its new season of growth. It was a long night with a Category II hurricane blowing up the coast. From a tropical depression just a day or so ago, this storm quickly bulked up into a strong hurricane. It came ashore across some of our favorite areas on the Outer Banks of North Carolina during the dark hours of early morning. We watched the storm’s progress until nearly midnight, and then gave up and went to bed. 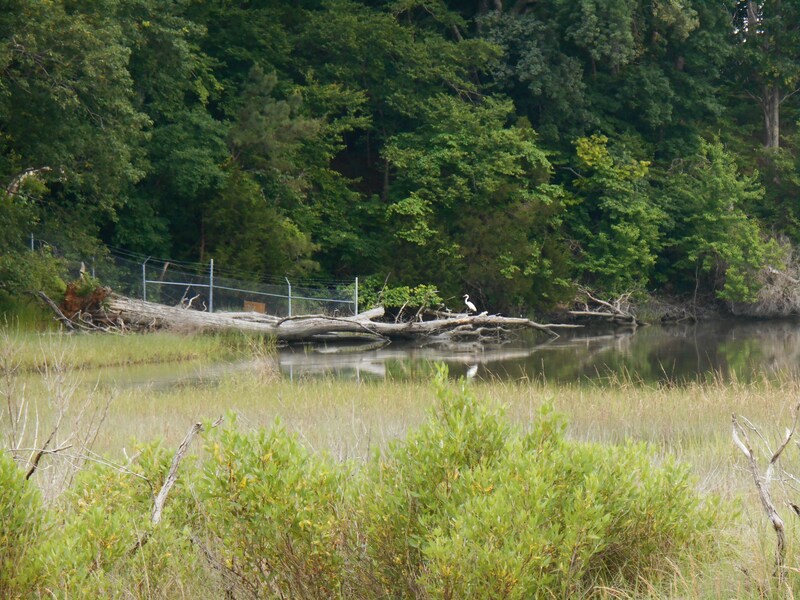 This Great Blue Heron greeted us as we entered the Colonial Parkway, after the storm had passed this morning. It grazed my beloved Topsail Island, and was headed to our special spots on Ocracoke and Hatteras as we watched the cast of the Weather Channel struggle against the strong wind and rain describing its progress in painful detail. This “Arthur” was touching friends and family all across the Carolinas. We hoped its touch would be as gentle as possible. 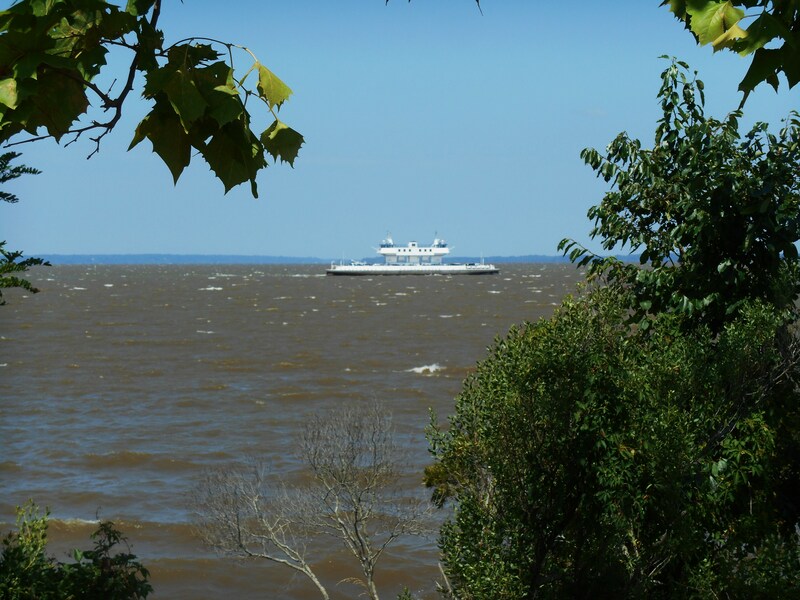 The Jamestown ferry navigated a very choppy James River on it route across from Surry County this morning. We knew that Route 12, where we’ve spent many happy hours driving through the wildlife refuge and photographing the shore birds, would be wrecked by morning. 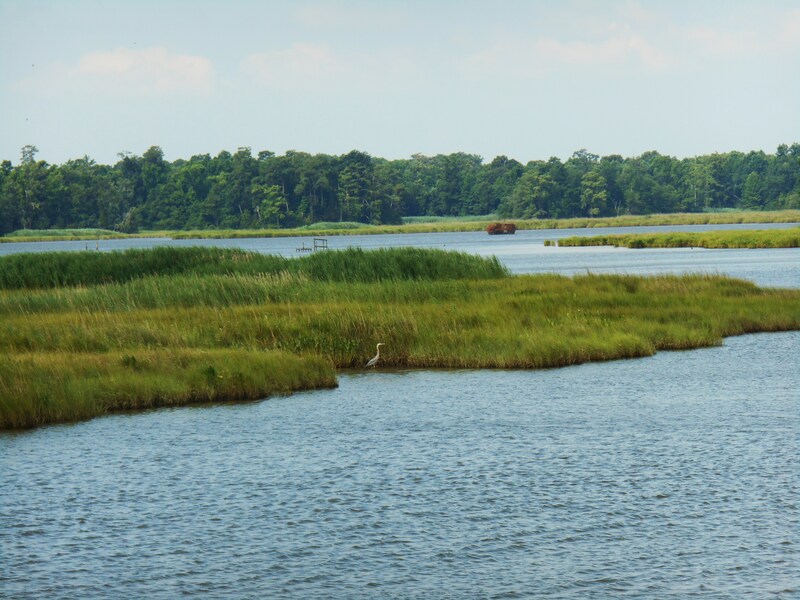 We love the coast of North Carolina and Virgina. A hurricane on this special holiday weekend is the last thing we wanted to watch; and yet we watched the unfolding, hoping it would weaken and turn away from the coast. I awakened a little before three AM to the sound of wind in the garden and rain on the roof. I had to know the progress of the storm and the updated forecast. So as quietly as possible, I headed back to the TV, pillow in hand. Our local meteorologists were broadcasting the story all night long. Their reporters stood in the weather giving updates, alongside crews from The Weather Channel and other networks. 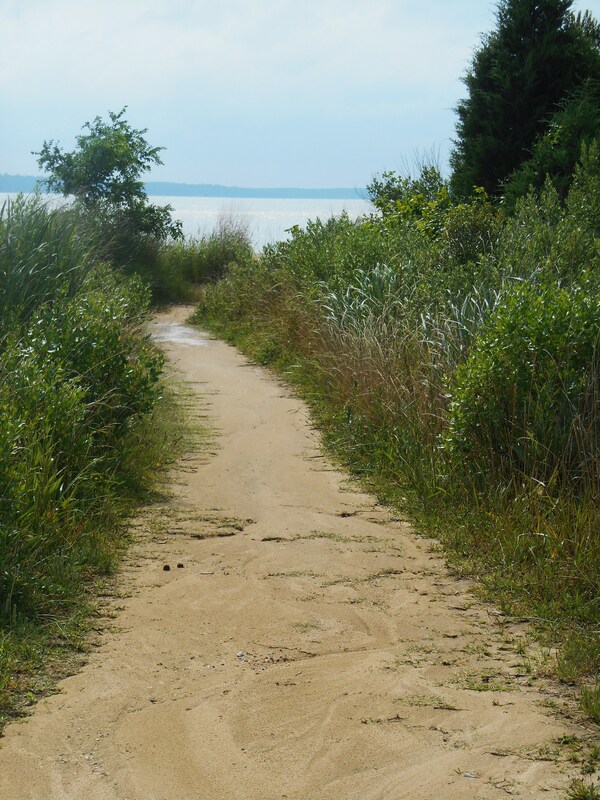 The path to the beach was wet this morning. 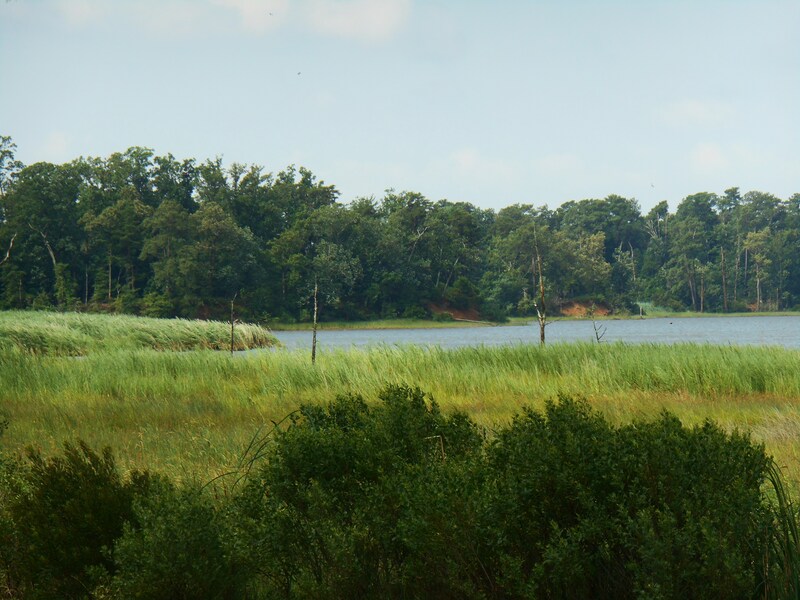 At three I heard of a possible tornado on the Lynnhaven Inlet at Virginia Beach. The warnings were extending northwards. I watched and worked my counted cross stitch for the next hour, until it was clear the storm had begun to move out to sea. Then to the couch for a little sleep. Though the sky is mostly clear, the wind has been with us all day. 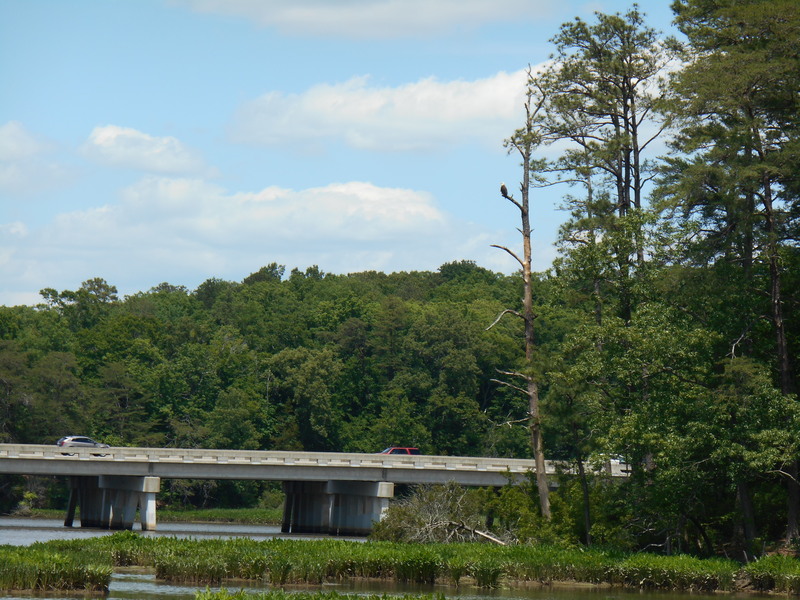 The sky was full of Eagles over the Colonial Parkway this morning. I checked in again at five, and saw that somehow Jim Cantore was still standing in Buxton. We had assumed that his producers were planning a Coast Guard rescue by helicopter, once that part of the island completely over-washed in the waves. That would make really good TV, and could be re-played by the Weather Channel cast for years to come. But, alas, he had found a steel and concrete structure and was braced against it, barely able to stand, ankle deep in sea water; but still giving live commentary as the storm rolled past. 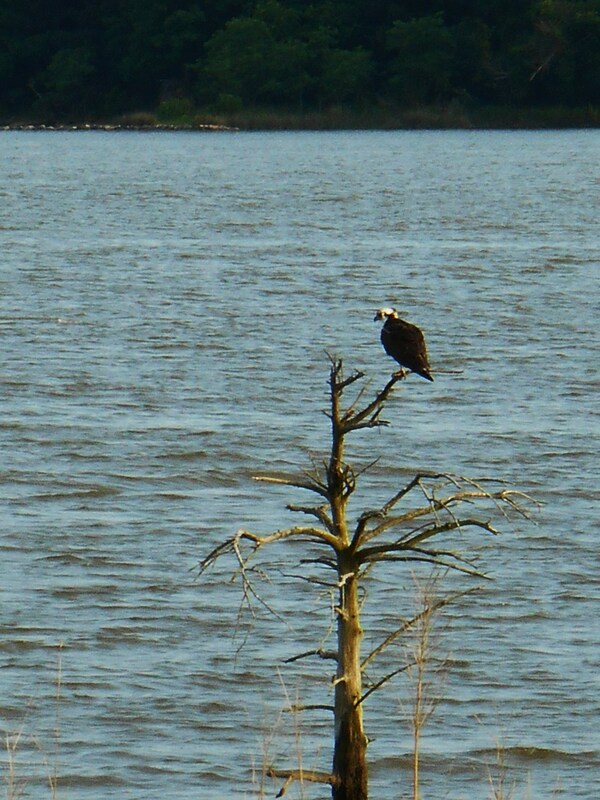 An Osprey Eagle greeting the morning, after the storm had passed. By a quarter to six, the forecast track clearly showed the storm turning out to sea. We were getting our much needed rain, and I still could hear the wind blowing through the trees. But the tornado warnings were gone. I decided to get some more sleep. 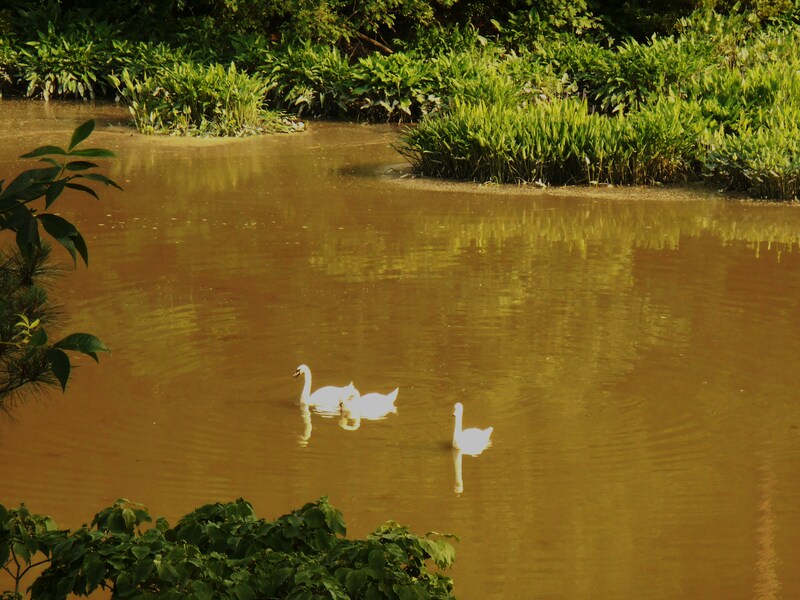 The Canada geese had come together in large flocks along the banks of the river to ride out the storm. By the time I awoke again a little after seven, it was light outside. 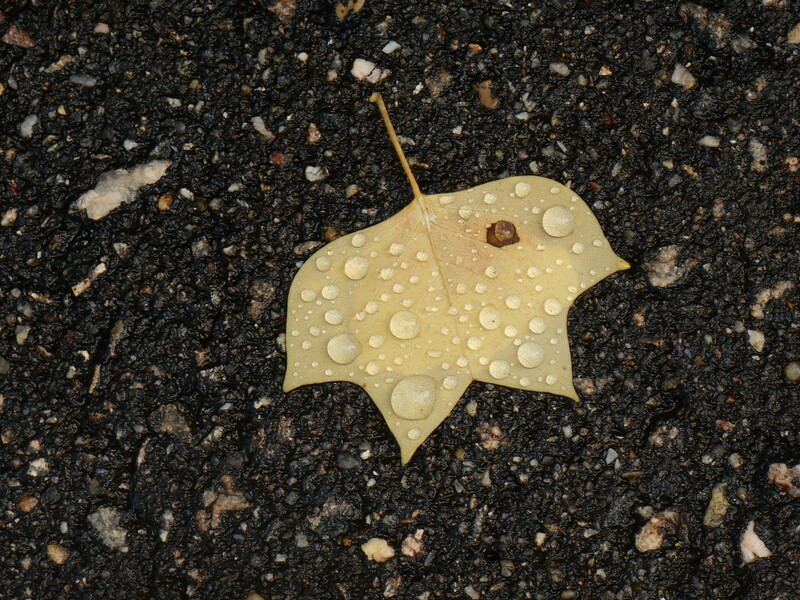 A gorgeous morning here with light rain and cool, moist breezes greeted us. We decided to head out to the Parkway to see what the morning held, and what the storm had left behind. 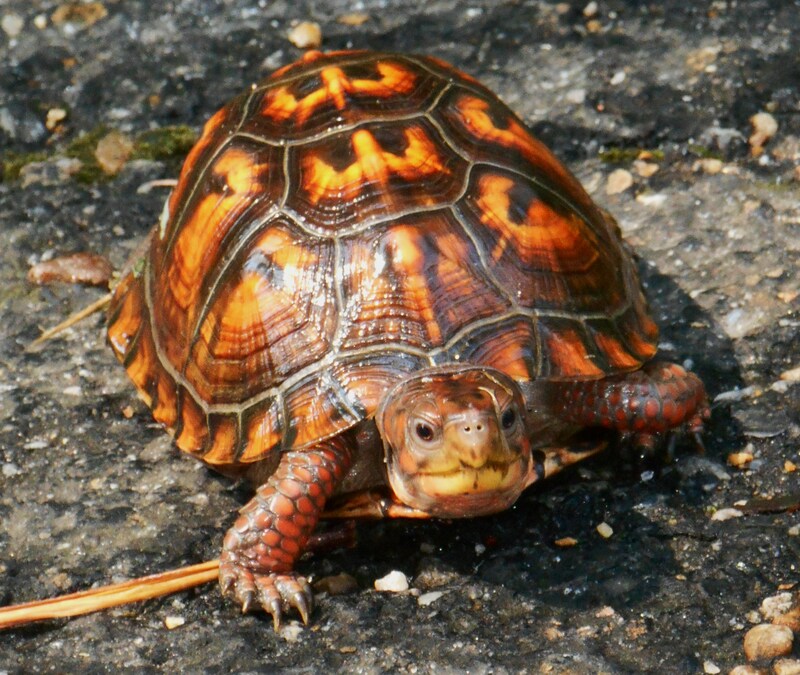 This beautiful Eastern Box Turtle was braving the quiet morning on Jamestown Island. A few branches had blown down, but we were so very fortunate to have no real damage. Our power was on, there was no flooding near us, and the trees in our community stood through the night. 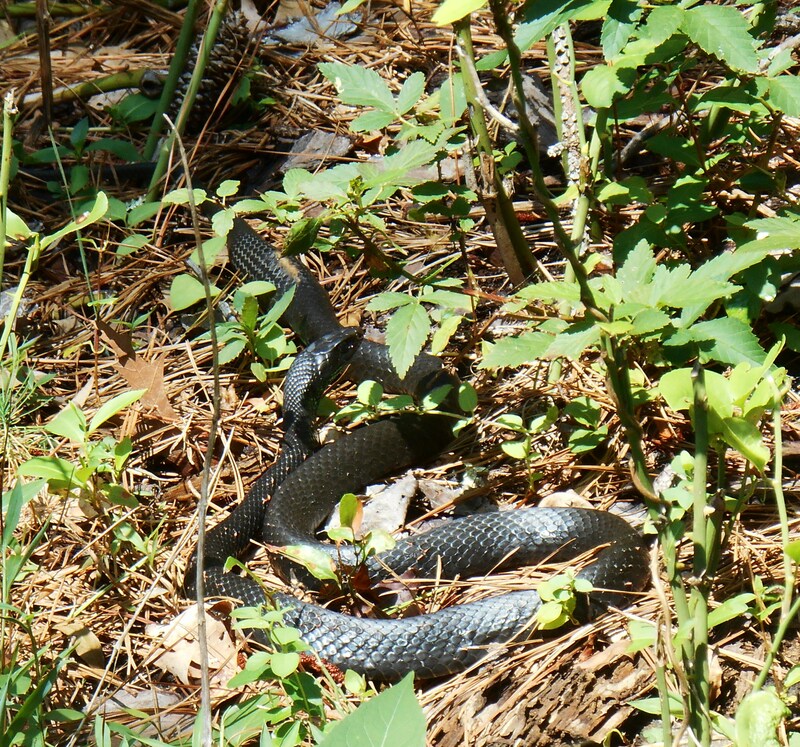 And this snake was sunning himself along the road on the island. We saw the outermost curved band of “Arthur” in the sky as we left our driveway. 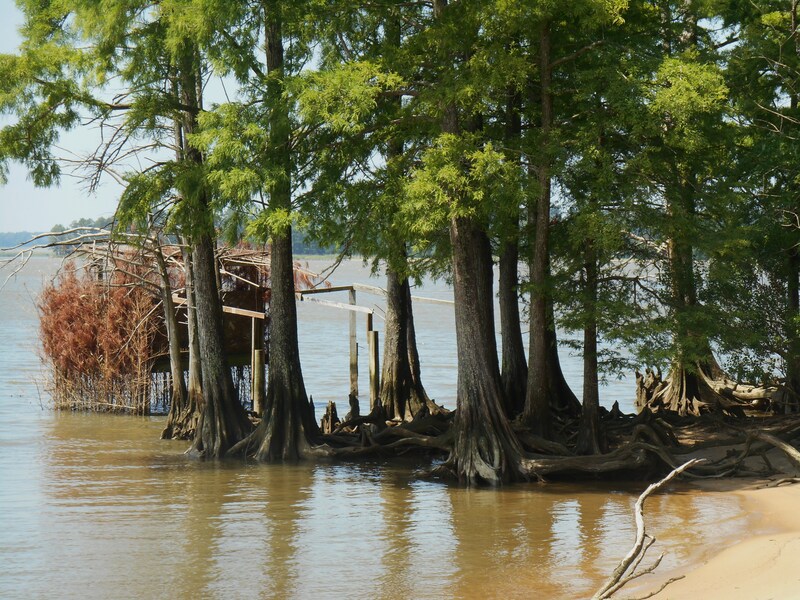 The duck blind, in the shelter of Cypress trees, withstood the winds overnight. It was a thin skim of clouds against the clearing morning sky. 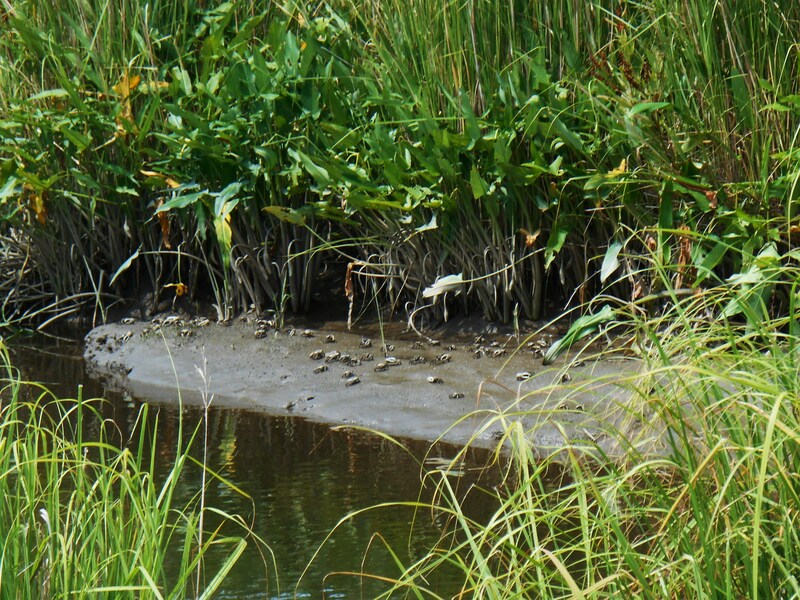 Crabs live in our brackish marshes. They didn’t mind the storm at all. The wind is still with us this afternoon. The storm continues moving north and east, towards another landfall in New England. I hope all touched by the storm can pick up the pieces, clean up the mess, and move on from this. 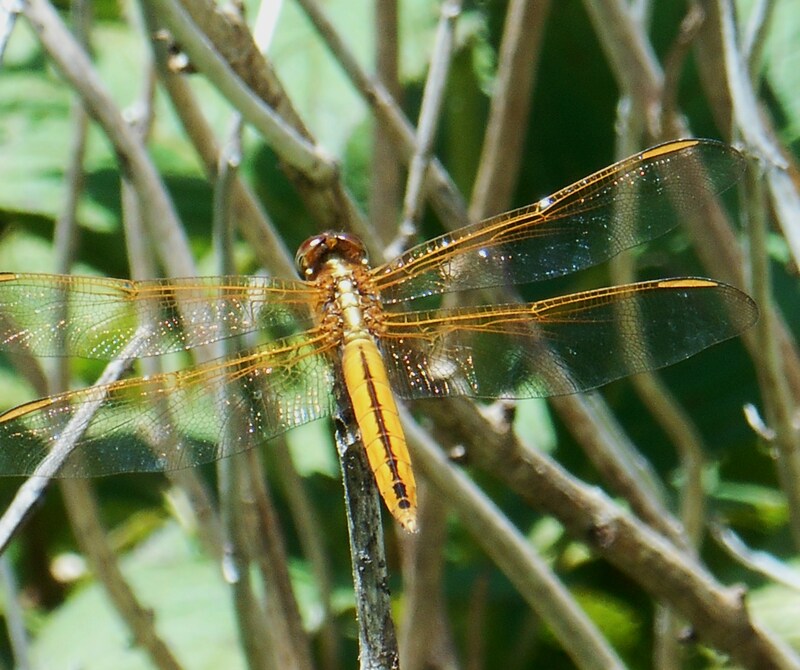 This golden dragonfly lives in our garden. We are glad to see he found shelter from the wind, and was out enjoying the sunshine by the time we returned home. It is only the first named storm of the tropical season. We’ll be watching our coastal waters from now until the end of November, hoping that all of the systems which form stay well out to sea, and far away from our beautiful coasts and our loved ones. 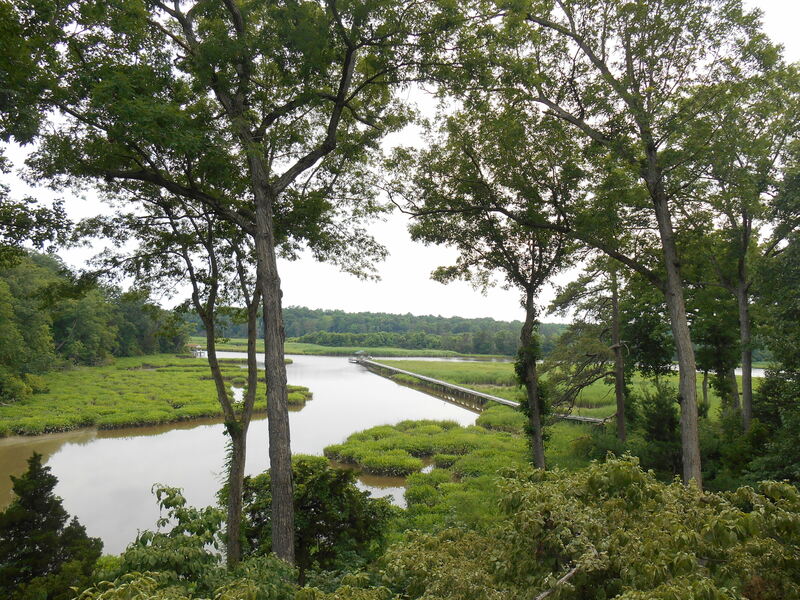 The view of College Creek from our friends’ deck. This is their little bit of heaven. 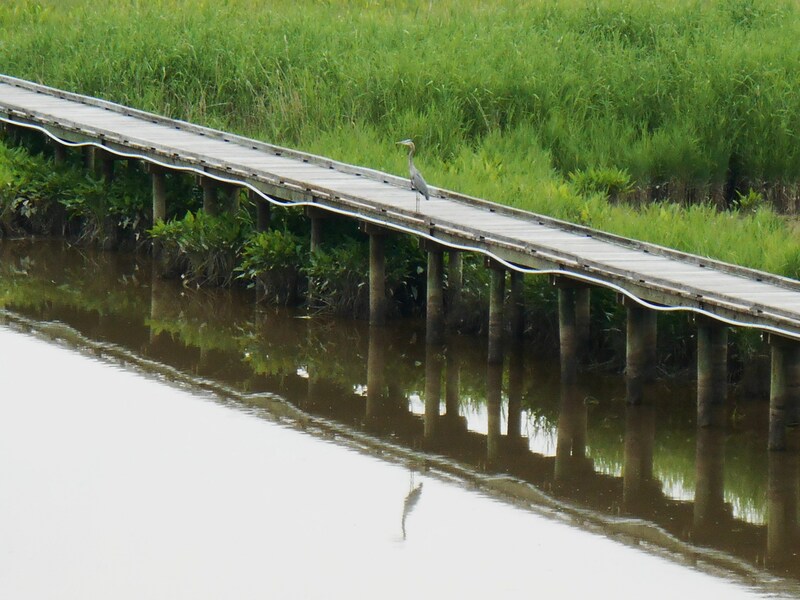 Do you see the Great Blue Heron standing on the pier? 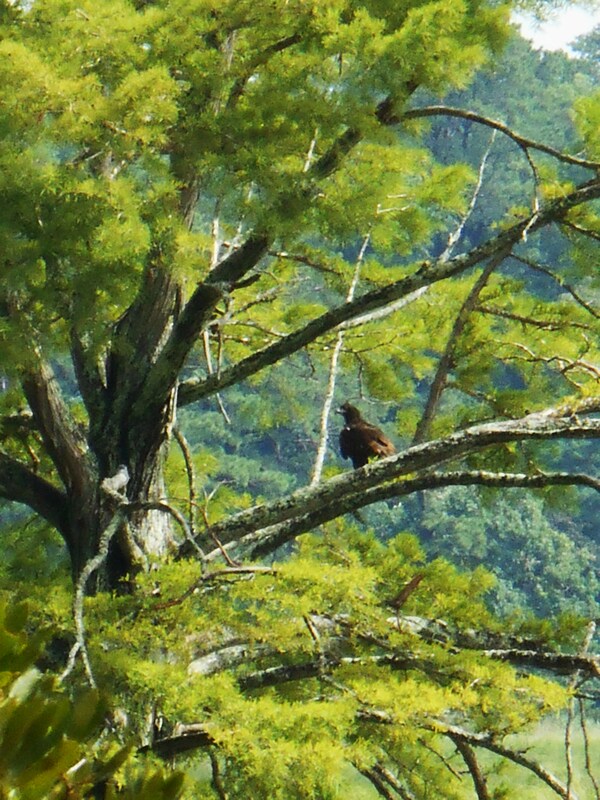 Friends invited us to sit with them on their deck overlooking College Creek yesterday afternoon. 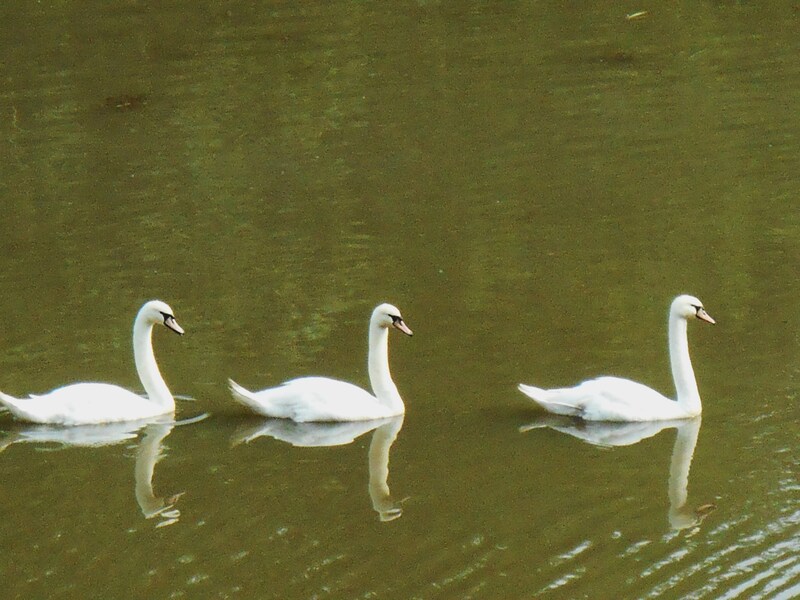 They see all sorts of beautiful creatures in the shallows of the creek behind their home. 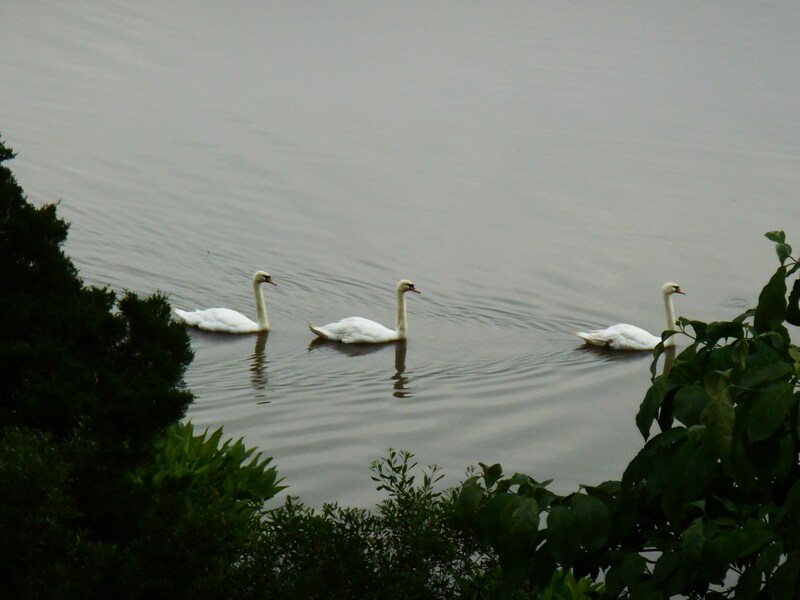 I’ve been hearing about swans and wild turkeys, eagles, herons, turtles, and other four leggeds who snack on their garden. So we sat in the shade and enjoyed the breeze blowing in from the water as we visited. I went despite a sting on my right hand earned earlier in the day while trying to plant a Lantana in the wrong spot. There was a nest of ground dwelling stinging insects right where I tried to dig. Probably yellow jackets, there was no apparent warning before the sharp pain in my hand. One stung, right through my gardening glove. I’m never afraid of bees or wasps. In fact, I kept bees for several years once upon a time. 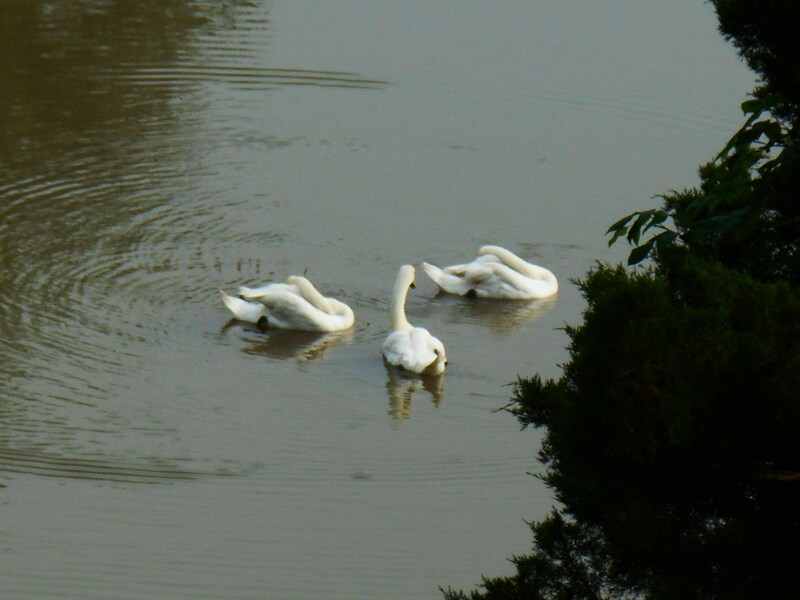 Always respectful of them, we generally coexist peacefully. And would have yesterday had I known of their nest in advance. But, I heard their buzzing after the shooting pain; and dropped my spade and skedaddled into the house to assess what had happened. The puncture was small, and the immediate pain mostly washed away under cold water and a poultice of baking soda, which draws out the venom. I went out to finish what was in progress (well away from where I had been working) and to clean up. But, unlike with most stings, this pain just kept spreading. It has been an interesting time since. Our friends gave me ice for the hand, and Merlot for the spirit. An excellent prescription. We had a good visit catching up with one another, while watching swans, lizards, fishing Osprey eagles and a beautiful Great Blue Heron. They shared their little bit of heaven with me. But my hand is still reacting to whatever venom chased me away from the underground nest of stinging creatures. It is swollen and sore. Not much good for typing at the moment. And Benadryl, while helping the swelling in my hand, leaves the rest of me a bit foggy. Summer here often feels like an endless succession of bites and stings. I was happy to hear the rain this morning, which meant the entire garden was watered nicely without any participation from me. And more is on the way. I hope you enjoy these photos from Sunday afternoon along College Creek. And I hope your weekend was also spent with friends and loved ones doing the things you most enjoy. 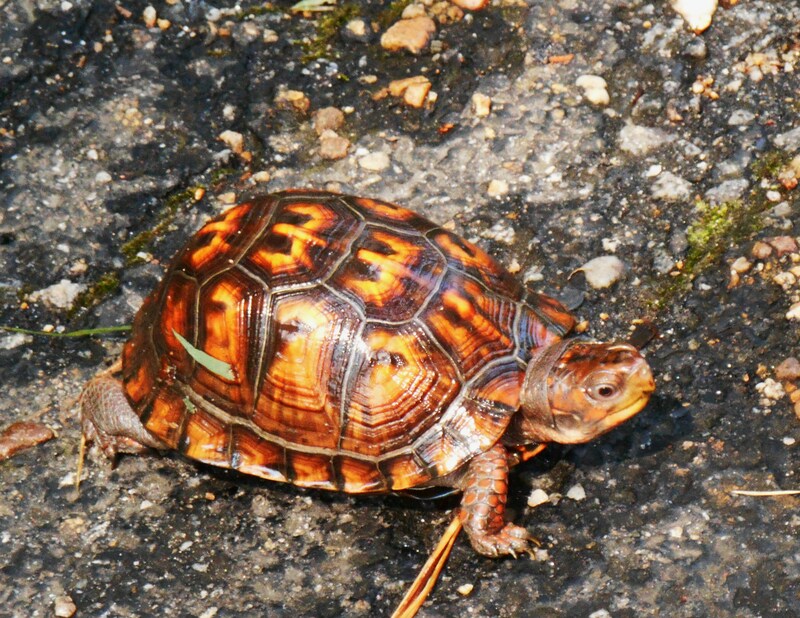 Here in James City County, Virginia, we live “elbow to elbow” with wildlife of all sorts. 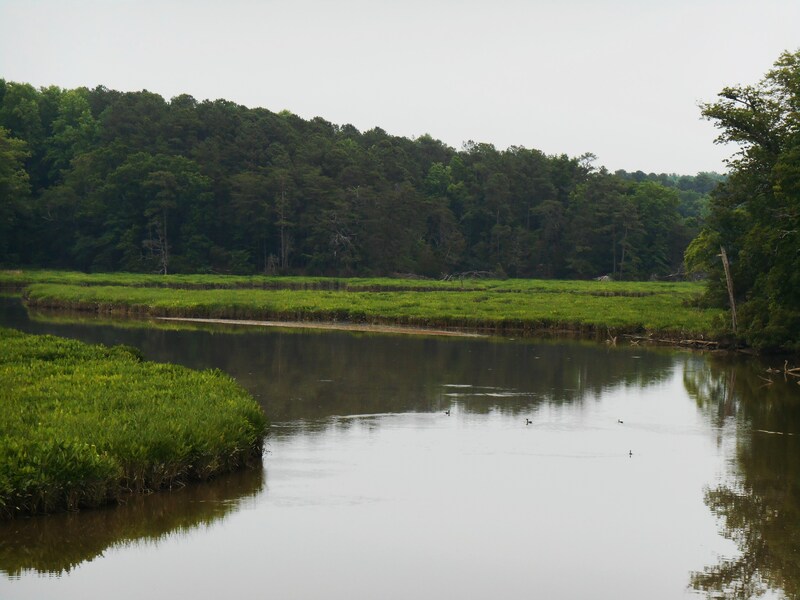 Situated between Tidewater and the Piedmont, a lot of our land remains undeveloped as forest, marsh, or swamp. Our older neighborhoods were built to blend in to the environment. 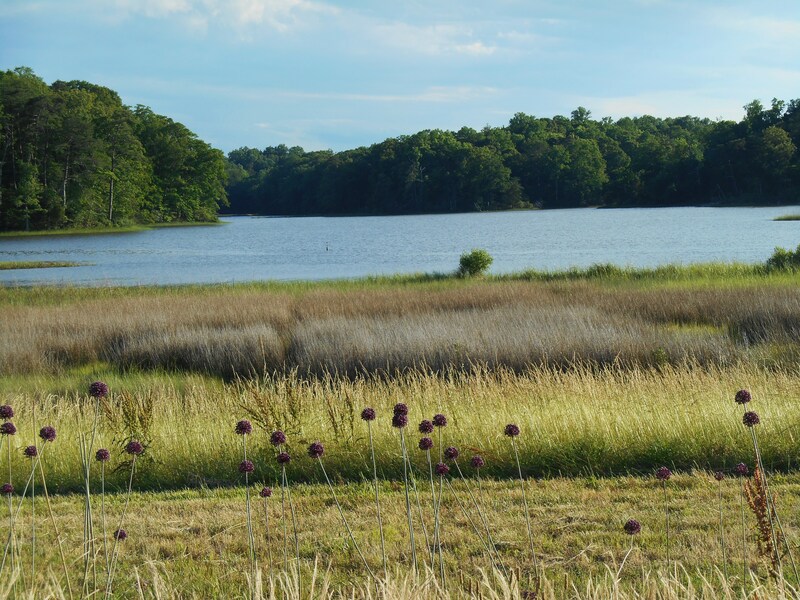 Only in recent years has our county government focused more on making money than on preserving the beautiful and rich environment we’ve inherited. We watch the clear cutting for new shopping centers and housing tracts with great sadness. 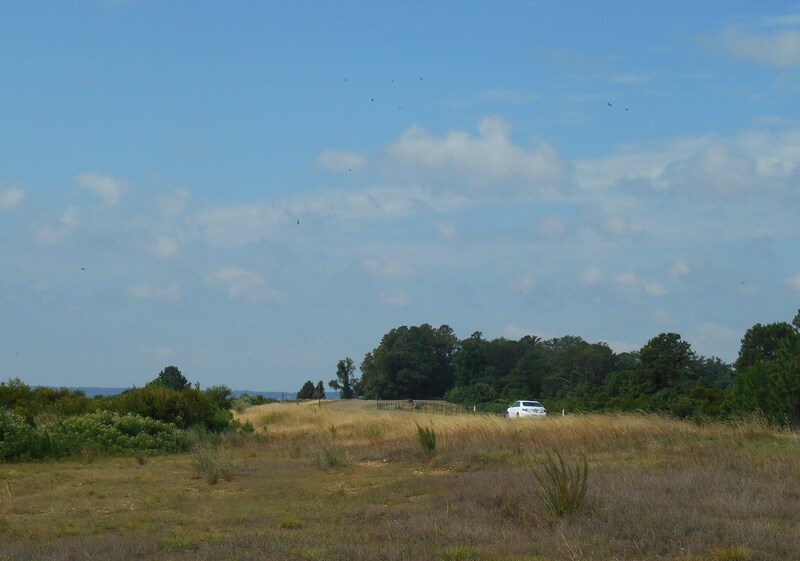 Not five miles from here, a developer is cutting new roads through the forests, destroying creeks, ravines, hillsides, and habitat in order to create a new office and retail park near a new hospital complex. 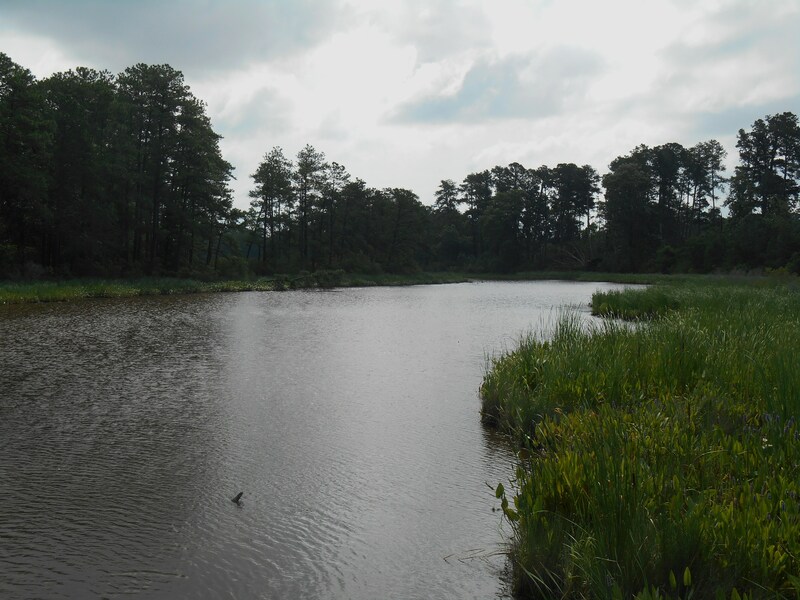 Someone is making gazillions of dollars, but acres and acres of beautiful forest and wildlife habitat are destroyed each day as this project continues. I can only imagine the back room negotiations which allowed this project to move forward. 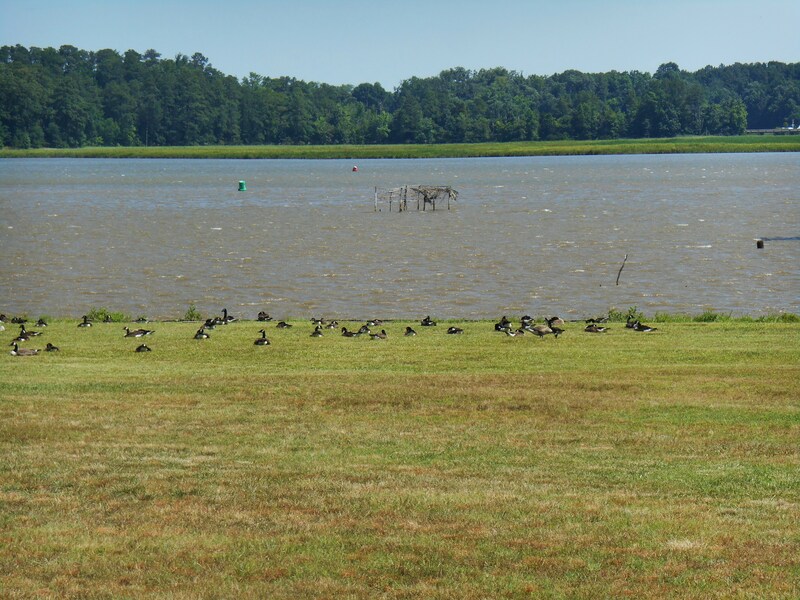 James City County was known, at one time, as an area with an unusually high number of different species of birds. 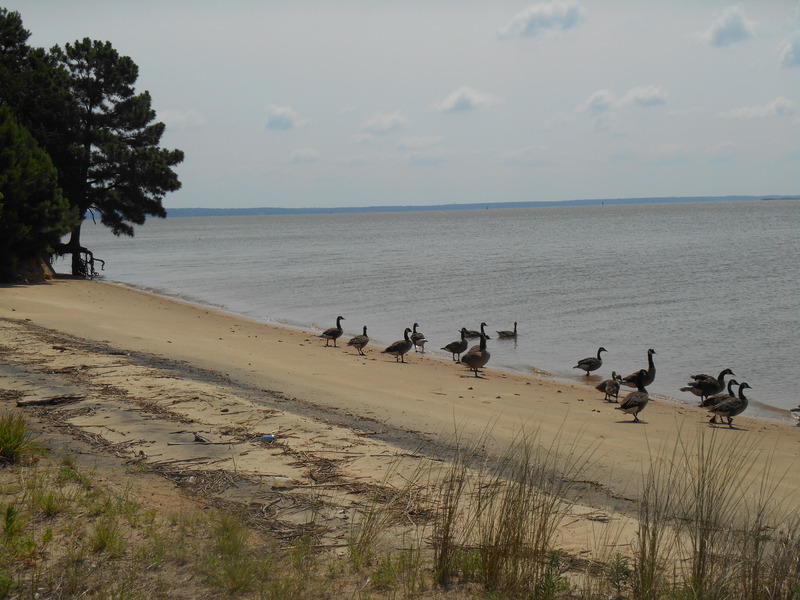 Part of the path of annual migration up and down the East Coast of the United States, birds have been drawn to our area to rest and eat along the way. 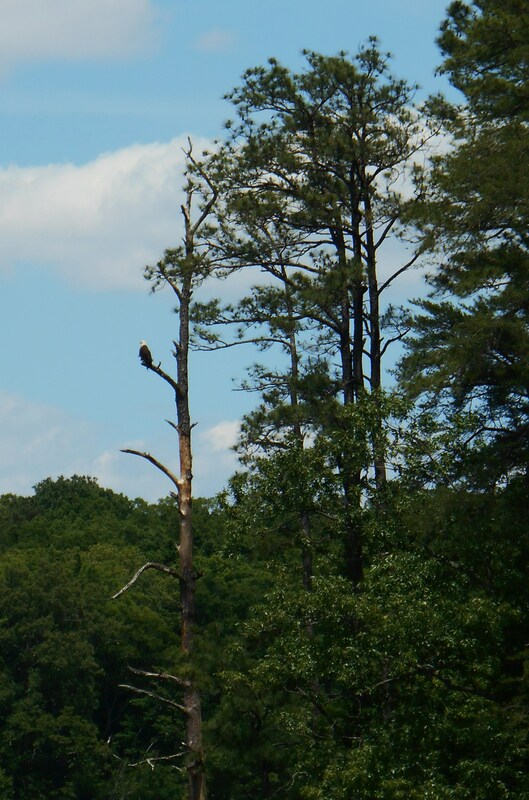 Many, like these lovely eagles, make our community their home, too. 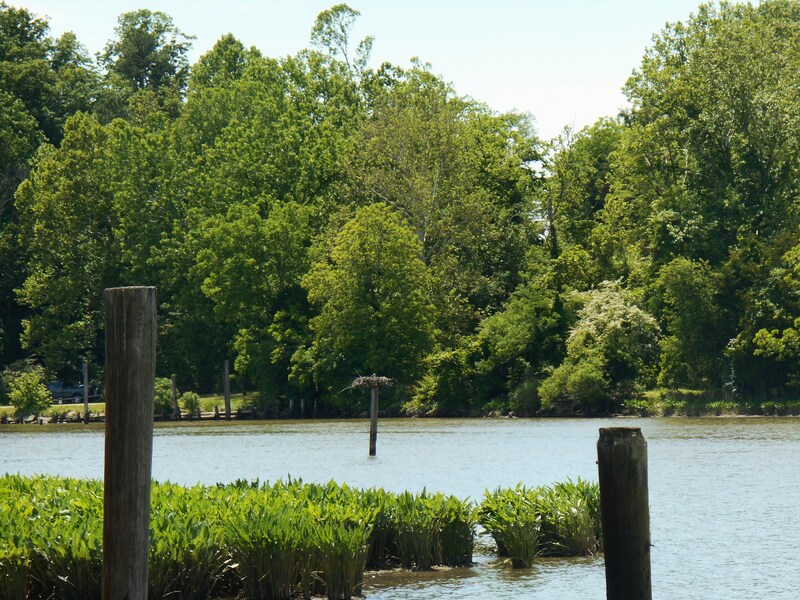 Just a few years ago, an out of town owner planned to develop this beautiful bit of land with several new homes squeezed in between College Creek and a major road. 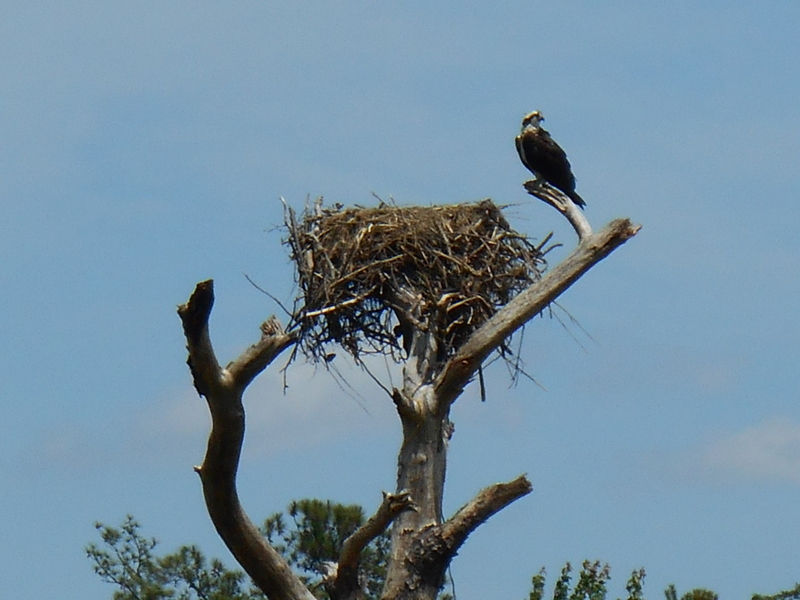 The presence of eagle’s nests was one of the factors which helped stop the deal from progressing. 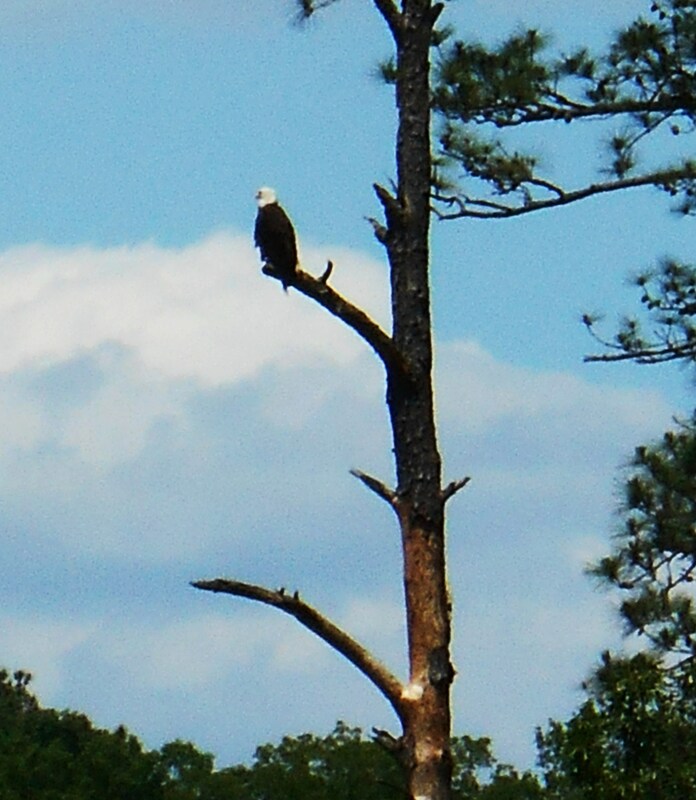 We are always glad to see the eagles. 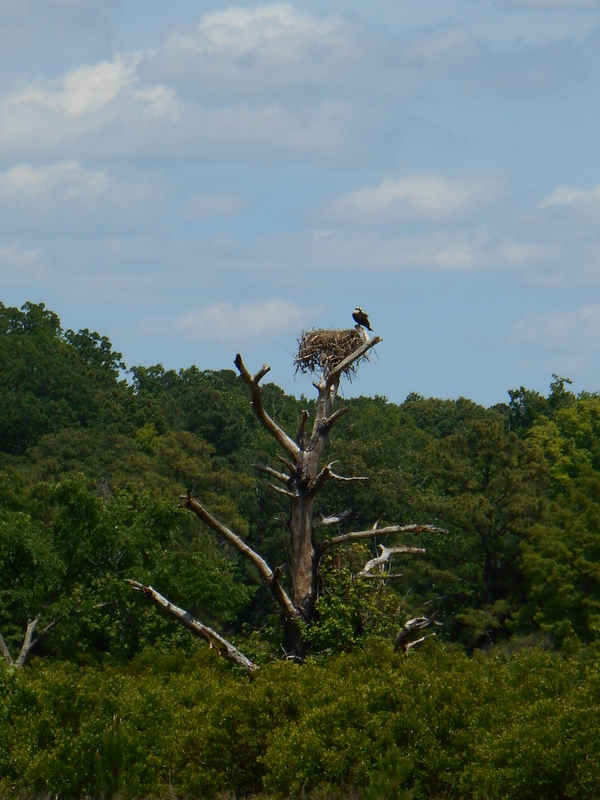 Their very presence is testament that the land and water are still clean enough to support them and their eaglets. So long as they choose to live here, we know the environment will support us, too.